On the left of the device are 5 boxes: – The biggest one, at the top, displays incoming notes as black lines, with their position from left to right determined by their pitch, it also displays the colored ranges of the next 3 boxes and the name of the last note played. – The 2nd, 3rd and 4th boxes show the ranges for up, down and both units respectively, you can click and drag within these boxes to set the ranges of notes they affect. 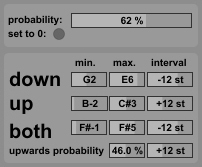 When notes fall within their ranges, the notes have a possibility of being displaced, the probability of this is set by the long slider in the top right of the device. When they displace notes they then display the notes as black lines, showing how far they were displaced. – The last box (labeled “thru”) displays notes that were not affected and went through the device unaltered. On the right are a set of controls. At the top is a long slider that sets the probability of an incoming note being displaced by the unit of whatever range it falls into. Below is a button that instantly sets the probability back to 0 as a reset. Other sliders include min. and max. sliders for more precise control of the custom ranges, and sliders to set intervals for each range. The interval sliders are, by default, all set to octaves, this is harmonically the safest option as it won’t result in any outside notes that weren’t there originally but by all means feel free to experiment (I recommend 7 st, 5 st, 2 st and 10 st as safe and potentially jazzy options). The sliders on the bottom row set the probability of the “both” unit displacing a note upwards as opposed to downwards, and the interval it would displace by if it was upwards. – If you hold ctrl while clicking and dragging on the range boxes, the range will move without changing size – Ranges can overlap, if the down and up units both have the same range you can get your note displaced both upward and downwards at the same time, creating a chord.